The passenger ferry, MV Nyerere, which capsized. 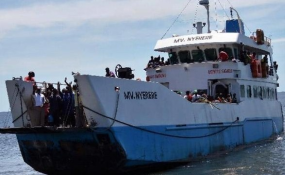 About 94 bodies have so far been retrieved from capsized MV Nyerere ferry. The ferry was sailing from Bugolora to Ukara in Ukerewe Island in Lake Victoria on Thursday afternoon. According to Daily News reporter Pius Rugonzibwa who is in Bwisya Village, the nearest village from the tragedy scene, the rescue is still underway. He also explained that Minister for Works, Transport and Communications Isaac Kamwelwe and the Inspector General of Police (IGP) Simon Sirro have arrived at the village and will later speak to the media. Rugonzibwa added that Bwisya Health Center where dead bodies and survivors are taken to, is flooded with people who are waiting to recognize their relatives' bodies and take them home. The exercise is expected to begin soon since the center's mortuary is still under construction.